3 National Parks and the Spectacular Antelope Canyon in just 3 days, enjoy the sights and take amazing photos while making new friends. Meet the friendliest tribe, the Navajo people on the largest Native American Reservation in the United States. After breakfast we depart to the Antelope Canyon, for a Navajo guided tour through the amazing slot canyon created by flood waters. Amazing pictures. 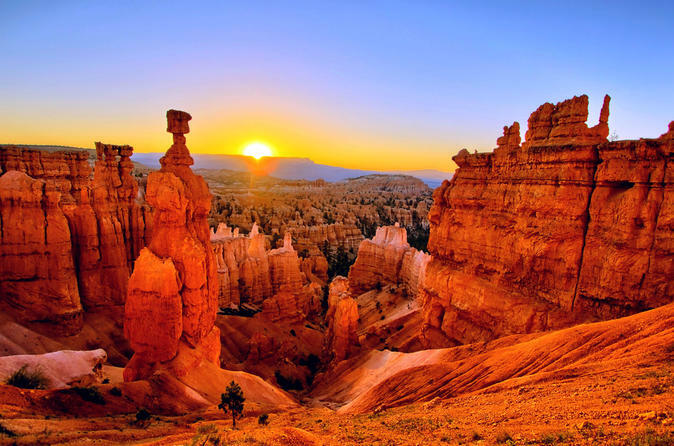 After the tour we head west to Bryce Canyon home to the most amazing natural sculptures of the world. Our tour will take us to see amazing rock and sandstone sculptures honed to perfection over thousands of years of rain wind and sunshine. After breakfast we head into Zion park. This area was a Sahara-like desert millions of years ago. Now the picturesque formations are home to endless trails through the majestic mountains. We spend some time here, taking in the views and the trails, From here we head to lunch in St George and then our drive back to Sin City Las Vegas.